When in 1846 the Belgian manufacturer of musical instruments Adolphe Sax had an instrument patented by the name of "saxophone", he enriched music with a new dimension of sound. The instrument he invented would combine in a unique way the features of woodwind and brass instruments. The multifold, faceted and versatile sound of the saxophone, which resembles string instruments, horns and even the human voice, has been fascinating for many composers ever since and led to the creation of a wideranged repertoire. The Tetraphonics saxophone quartet thus proposes a large and diversified literature: beside a focus on contemporary original compositions where modern techniques are used, the quartet presents transcriptions from different genres. An interpretation true to the original is considered to be very important, performed - however - with due respect to the saxophone's characteristic features. 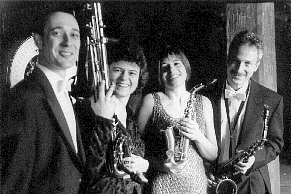 The musicians, i.e Christine Rall (soprano saxophone), Elmar Frey (alto saxophone), Volker Ax (tenor saxophone) and Claudia Schatzle (baritone saxophone) integrate their individual musical experience into the ensemble work and biend into a balanced and homogeneous body of sound. Tetraphonics musicians studied with renowned saxophonists Carina Raschèr, Jean-Marie Londeix, Patrick Meighan and John Sampen. Since their debut, they regularly performed with important orchestras, including the Munich Philharmonics, the GürzenichOrchester of Cologne, the orchestra of the Bonn Beethovenhalle, the symphonic orchestra of SWF, SR Radio and the Bayerischer Rundfunk, the Cologne WDR Radio Big Band, the King of Swing Orchestra and Peter Herbolzheimer's Rhythm Combination and Brass Big Band. Since its founding in 1994, Tetraphonics have premièred numerous works which had been dedicated to this quartet. Additionally, the quartet has been looking for new ways to realize projects with dance performers, recitation or musical theater in order to employ a maximum of this young instrument's infinite expressiveness.